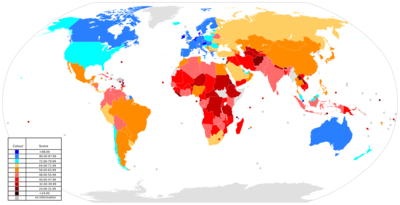 The Globalization Index defined by KOF, which measures three important dimensions of globalization: economic, social, and political. Globalization (or globalisation) is the liberalizing of a national government's political, social and economic components into the framework of international governing bodies and institutions. Supporters of globalization are called globalists. Globalists interpret and apply protocols crafted within the language of common world-wide treaties that attempt to supplant order from chaos by honing cooperation between foreign governments during times of economic crisis, political turmoil and war. The Age of Discovery (15th-17th century) was dominated by the European peoples. Spain, Portugal, and the British Empire used water transport to explore and map out the known world. This introduced interaction between large swaths of land, ruled by opposing empires, on a scale never before contemplated. The Eurasian and African continents, for example, engaged in abundant trade of culture and peoples with the New World, raising the standard of living of all trading partners. This time of European naval expansion saw the rise of modern nation states which helped distribute influence and supplant fertile ground for diverse national cultures. A foreign policy embodied in a civilization, that can be called proto-globalization, extirpates local and regional differences across the globe homogenizing human societies toward a common path of modernity. During the 18th, 19th and 20th Century Western civilization or the West referring to North America and Europe (more specifically Western Europe) is a consistently integrated path of modernism that forms many geopolitical influences. Cornerstones of civilization such as culture, law, and religion coincide through political philosophy and with an economic history of proto-globalization within the West, led to an exportation of western modernism. Applied with varying degrees, for better or worse, is seen by most across the world as imperialism by the British Empire and hegemony by the United States. Nations of the world had forced upon them, a path that they would either adopt completely, reject wholeheartedly and replace it by a strict brand of their own modernism, stasis, or a hybrid system. With support for only specific elements of Western civilization, namely economic proto-globalization, many nations map out a hybrid system for the support of their own identity of regional traditional culture as well as support for unique posturing in the international community allowing their own national interest to play a key role. Internal domestic politics form which are consistent with its societies heritage and culture is then used to aggressively assert or respond back to the West. Subtly during the 20th and 21st centuries industrial modernism through the Western civilization template, has been pushed back significantly and continues to be challenged by many, now modernized and sufficiently culturally assertive non-West nation states. A common task of shaping a, "new world order," as some globalists refer to it, out of the diversity of many non-West nation states is to foment cooperation through mitigating disaster in any way between regionally globalized economic zones. These regionally globalized zones, or what is called regionalization, are in turn created by their respective national governments. Most but not all of these member countries are democratic, thus national governments are placed into power as representatives of their nations people. The international stage however gives a foreign country of the same global organization equal standing because citizens in any country do not vote for membership. It is a geopolitical system that conceptualizes and operates on cooperation between one nation and another government of another nation or regional bloc of many nations, it is not a system that relies on and thus must revere the relationship between the citizen and their government. This has translated over to the anti-globalization activists as an unacceptable lack of transparency in which manifests protests by, at times, radical anarchist groups. Countries have become the new citizen of the world within globalization. It is from the people nations gain power. From the national sovereignty ceded to global government without vote, representative power is non-existent. The United Nations or UN as it is most commonly known was originally the League of Nations (LoN), an organization founded by the Treaty of Versailles in 1919-1920 that was used to push the Rights of Man. By 1935 the LoN had 58 member countries and wasn't until 1945 that World War II required it to maintain a much greater presence, this then created the United Nations. The United Nations today consists of 192 member states. The Security Council, a sub organization within the UN has representatives from member countries present at the United Nations Headquarters at all times. The five permanent members are China, France, Russian Federation, the United Kingdom and the United States. The ten non-permanent members are Austria, Japan, Turkey, Bosnia and Herzegovina, Lebanon, Uganda, Brazil, Mexico, Gabon and Nigeria. The many meetings are the enforcement or discussion of international security through a world government body creating policy and implementing it. Used to supervise and liberalize member nation trade it was originally brought into existence through the General Agreement on Trade Tariffs or GATT. GATT was the outcome of failed negotiations for the International Trade Organization, formed in 1950 it lasted until 1995 when the World Trade Organization took over its role of reducing barriers to international trade. The change from GATT to the WTO was indeed massive because GATT was merely an agreement not an international organization. The WTO now consists of 153 member countries. The 27 states of the European Union are called the European Communities within the WTO framework as members do not have to be fully sovereign. “ The economic and financial crisis marks the end (for now) of a rapid expansion of globalization. The IMF and other such institutions become the main source of financial borrowing and lending of a country rather than the respective member countries involved. Building a civilization with core nation states demands trade with other nations to expand in power or sustain it. Based on historic cooperation with The West, regional globalization of East Asia or the Islamic Middle East civilizations are examples of ushering in regional equality. With the majority of countries maintaining a socialist-democratic system of government, redistribution of wealth from rich nations to poor nations occurs just as it happens with one group of citizens having to redistribute their wealth to other groups of citizens under national socialism. A type of global progressive socialism, separating the world into regional economic blocs of power, has become the most influential type of economic governance with the ability to lower one countries status and lift another. Since the inception of the European Union and its Common Market with the Euro currency other regions of the world can now base their integration on a somewhat successful trend. The League of Arab States or the Arab League was founded in Cairo in 1945 by Egypt, Iraq, Lebanon, Saudi Arabia, Syria, Jordan and Yemen. Today it consists of 22 member countries stretching from the north west to the north east of Africa and the Middle East regions of the world. Through this consolidation of representation of multiple countries on the international as well as regional diplomatic stage has helped evolve the Arab League into an effective influential force. Economic cooperation comes in the form of The Greater Arab Free Trade Area (GAFTA) that came into effect January 1, 2005. European Union, or more commonly called the EU can be traced to its earliest forms in 1952, is a confederation of European countries for the cooperation of common interests within several areas, such as economics. More recently due to the emerging threats the likes of which were seen on September 11, 2001 within the United States of America, a common security approach has been brought to the forefront. The Association of South East Asian Nations was established on August 8, 1967. The process of creating a Free Trade Area of the Americas (FTAA) was begun in 1994 when the Heads of State and Government of 34 democracies in the region met to decrease barriers to trade and investment. The members pledged these would be largely finished by 2010 for industrialized economies and 2020 for developing economies a result of which are substantially lower tariffs then previously. The main thrust is to accelerate regional economic integration. Originally the OAU or Organization of African Unity in 1963, in 2002 the African Union was officially established as the intergovernmental organization successor and now has 53 African member states. The African Charter on Human and People's Rights (Nairobi 1981) and the Grand Bay Declaration and Plan of Action on Human rights: two instruments adopted by the OAU to promote Human and People's Rights in the Continent. The Human Rights Charter led to the establishment of the African Human Rights Commission located in Banjul, The Gambia. Africa's Priority Programme for Economic recovery (APPER) - 1985: an emergency programme designed to address the development crisis of the 1980s, in the wake of protracted drought and famine that had engulfed the continent and the crippling effect of Africa's external indebtedness. OAU Declaration on the Political and Socio-Economic Situation in Africa and the Fundamental Changes taking place in the World (1990): which underscored Africa's resolve to seize the imitative, to determine its destiny and to address the challenges to peace, democracy and security. Cairo Agenda for Action (1995): a programme for relaunching Africa's political, economic and social development. African Common Position on Africa's External Debt Crisis (1997): a strategy for addressing the Continent's External Debt Crisis. The New Partnership for Africa's Development (NEPAD) : adopted as a Programme of the AU at the Lusaka Summit (2001). During the time period of history called the Ancient Near East, empires controlled over what would be considered many countries if using today's terminology. In fact it would consist of not just many nations or countries but indeed many regions even. Massive empires stretched across vast lands and instituted their brand of rule throughout the so-called known or conquered world. Usually lead by brutal leaders, ancient empires gave way to the medieval and then modern world. As history progressed toward modernity, it also led toward more controllable geographical units of sovereignty. This cultivated an atmosphere which globalization took root. It can be considered realized after the founding of the New World. What was brought forth through the end of the Thirty Years War was a treaty. It was called the Treaty of Westphalia (signed between May and October of 1648). It ushered into the world a new political order, starting across Europe. Instituting enough stability that the concept of the nation state becomes a reality. Through this applied concept internal boundaries were outlined within the European continent and modern globalization advanced outward to the rest of the world. Except not by a large empire, but by powerful nation states the geographical units that used to make up empires of antiquity. Geography or land becomes less a necessity of power when set against ideals of sovereignty. In other words the geography shrinks back into the hands of the individual. Globalization unites the entire world under common political ideals, which are generally socialist in the economic sense. The unfolding from empire to nation state becomes ever-more focused, but within globalization it starts with the world now, not just empires or states or individuals. The international, world citizen mindset starts with the macro, or world within globalization. The macro view is then telescoped by those who support into themselves as individuals. This is opposed to classical liberalism and conservatism which focuses on individual sovereignty and then projects that mindset or political philosophy into the world. As the geographic core of political rule from which extension of itself is brought upon the whole world begins to shrink, from empire to state (because globalization assumes the world in place of the individual) the situation ripens for a mere person to to lead the world. Globalization provides the institutions that are required for the macro mindset that creates a state of affairs in the world for the rule of one man. From one man to the world, the world cannot be ruled, but from the world to the man, then the world may be tamed through one man by way of international cooperation. Such historical implication regarding world events means a great deal within the eschatology of a biblical theology. The Bible speaks of a world-wide leader and avowed anti-Christ that will arise during the most turbulent of times. An epoch of history the Bible calls, the end of times, at which point through either a conscious or sub-conscious injection of the spirit of Satan, this person will become the causal agent for direct Satanic influence through the world like no other time in history. This person will be absolutely instrumental in solving the worlds most vexing issues introducing a security of false peace. If the anti-Christ is to achieve truly global change there has to be in place already finely tuned systems that allow for the implementation and application of answers to these issues. Globalization as potent a force as it is in today's world can be seen as the mechanism and consciousness to produce the change necessary. ↑ EU leaders unite behind U.S. This page was last modified on 30 November 2015, at 17:06.